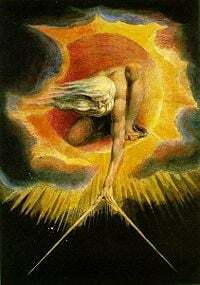 William Blake's "Ancient of Days" has been interpreted by some as a depiction of the Demiurge. Demiurge (from the Greek δημιουργός dēmiourgós, meaning "artisan" or "craftsman") is a term for a creator deity or divine artisan responsible for the creation of the physical universe. The word was first introduced in this sense by Plato in his Timaeus, 41a (ca. 360 B.C.E.). It subsequently appears in a number of different religious and philosophical systems of Late Antiquity, most notably in Neoplatonism and Gnosticism. Three separate meanings of the term may be distinguished. For Plato, the Demiurge was a benevolent creator of the laws, heaven, or the world. Plotinus identified the Demiurge as nous (divine reason), the first emanation of "the One" (see monad). In Gnosticism, the material universe is seen as evil, and the Demiurge is the creator of this evil world, either out of ignorance or by evil design. Alternative Gnostic names for the Demiurge include Yaldabaoth, Yao or Iao, Ialdabaoth and several other variants. The Gnostics often identified the Demiurge with the Hebrew God Yahweh. Christian opposition to this doctrine was one factor in the decision of the Church to include the Hebrew scriptures of the "Old Testament" in the Christian Bible. 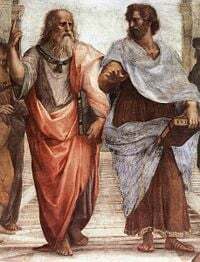 Detail of The School of Athens by Raphael (1509), showing Plato (pointing upwards, as if to the Form of the Good) and Aristotle (holding his hand palm down to Earth, favoring material evidence). Plato's character Timaeus refers to the Demiurge frequently in the Socratic dialogue which bears his name, written around 360 B.C.E. Timaeus refers to the Demiurge as the entity who “fashioned and shaped” the material world. He describes this being as unreservedly benevolent and hence desirous of a world as good as possible. The world remains imperfect, however, because the Demiurge had to work with pre-existing chaotic matter. Timaeus suggests that since nothing "becomes or changes" without a cause, there must be a cause of the universe itself. He thus refers to the Demiurge as the father of the universe. Moreover, since the universe is fair, the Demiurge must have used the eternal and perfect world of "forms" or ideals as a template. He then set about creating the world, which formerly only existed in a state of disorder. Timaeus states that it is "blasphemy to state that the universe was not created in the image of perfection or heaven." For Neoplatonist writers like Plotinus, the Demiurge was not the originator of the universe, but a second creator or cause (see Dyad). The first and highest God is the One, the source, or the Monad. The Monad emanated the Nous, divine mind or reason, which Plotinus referred to as the Demiurge. In this Plotinus claimed to reveal Plato's true meaning, a doctrine he learned from Platonist tradition but did not appear outside the academy or in Plato's texts. Writing in the third century C.E., Plotinus was clearly aware of Gnostic teachings about the Demiurge and wrote in part in opposition to them. In relation to the gods of mythology the Demiurge is identified as Zeus within Plotinus' works. 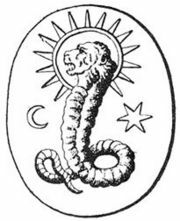 A lion-faced deity found on a Gnostic gem in Bernard de Montfaucon’s L’antiquité expliquée et représentée en figures may be a depiction of the Demiurge. Like Plato, Gnosticism presents a distinction between the highest, unknowable God and the demiurgic “creator” of the material world. However, in contrast to Plato, several systems of Gnostic thought present the Demiurge as antagonistic to the will of the Supreme Being. His act of creation either occurs in unconscious imitation of the divine model, and thus is fundamentally flawed, or else is formed with the malevolent intention of entrapping aspects of the divine in materiality. In such systems, the Demiurge acts as a solution to the problem of evil. In the most common form of Gnosticism, the Demiurge had an inferior though not intrinsically evil function in the universe as the head of the psychic world. According to second-century teacher Marcion—not yet a fully developed Gnostic, but an important member of the Roman Church until his views were declared heretical—the Demiurge was to be sharply distinguished from the Good God. The Demiurge was severely just, the Good God loving and gentle. The Demiurge was actually the God of the Jews, while the true God was the Heavenly Father of Jesus and the Christians. Christ, though in reality the Son of the true God, came in the guise of the Messiah of the Jews, the better to spread the truth concerning his Heavenly Father. The true believer in Christ enters into the God's kingdom, while the unbeliever remains forever the slave of the Demiurge. 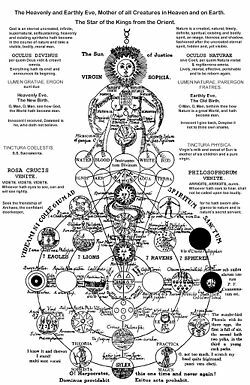 Ialdabaoth's mother Sophia and her emanations, according to an eighteenth century gnostic chart. Later Gnostics held that the Demiurge was the great tyrant Ialdabaoth, the Son of Chaos. He is the maker of man, but is filled with envy because of the spark of divine light within each human soul. Ialdabaoth thus tries to limit man's knowledge by forbidding him the fruit of knowledge in paradise. This Demiurge, fearing lest Jesus—whom he had intended as his Messiah of wrath—should spread the knowledge of the Supreme God, had him crucified. At the consummation of all things, all light will return to the fullness (pleroma) of heaven. However, Ialdabaoth and the material world, together with those humans associated with them, will be cast into the lower depths. One Gnostic myth recounts that Sophia (Greek, literally meaning “wisdom”), the Demiurge’s mother, and a partial aspect of the divine Pleroma or “Fullness.” She desired to create something apart from the divine totality. However, she did this without divine assent. In this abortive act of separate creation, she gave birth to the monstrous Demiurge. Then, being ashamed of her deed, she wrapped him in a cloud and created a throne for him within it. The isolated Demiurge did not behold his mother, nor anyone else. Being ignorant of the superior levels of reality that were his birth-place he concluded that only he himself existed. The Gnostic myths describing these events are full of intricate nuances and variations, portraying the declination of aspects of the divine into human form. This process occurs through the agency of the Demiurge who, having stolen a portion of power from his mother, sets about a work of creation in unconscious imitation of the superior realm. Thus Sophia’s power becomes enclosed within the material forms of humanity, themselves entrapped within the material universe. The goal of Gnostic movements was typically the awakening of this divine spark of wisdom, enabling the enlightened soul to return to the superior, non-material realities which were its primal source. According to the Gnostic teacher Valentinus, the Demiurge was the offspring of the union of Sophia's daughter Achamoth with matter. Achamoth herself was the last of the 30 Æons. Thus, the Demiurge was separated by many emanations from the Supreme God. In this view, the Demiurge, in creating this world out of chaos, was unconsciously influenced for good by the higher Aeon Jesus Soter, the Logos; and the universe became almost perfect. The Demiurge, however, regretted even this slight imperfection. Thinking himself to be the Supreme God, he attempted to remedy this by sending his Messiah, who in turn became united to the pre-existent Jesus, and thus provides the way to redemption, not through his death on the Cross, but by revealing the secret Truth of Gnosticism. In Valentinian eschatology, carnal men will return to the grossness of matter and finally be consumed by fire. The second level of humans, called "psychic" men, will enter a middle state, neither heaven (pleroma) nor hell (hyle), where they will dwell together with the Demiurge as their master. The purely spiritual men, who have been enlightened to the Truth, will be completely freed from the influence of the Demiurge. Together with the Savior and Achamoth, his spouse, they will enter the pleroma of heaven. Some Gnostics were not satisfied merely to emphasize the distinction between the Supreme God, or God the Father, and the Demiurge. In many of their systems, they conceived the relation of the Demiurge to the Supreme God as one of actual antagonism. The Demiurge thus became the personification of the power of evil, the Satan of Gnosticism, with whom the faithful had to wage war to the end that they might be pleasing to the Good God. The Gnostic Demiurge then assumes a surprising likeness to Ahriman, the evil counter-creator of Zoroastrian philosophy. The character of this outright evil Demiurge became still more complicated when in some systems he was identified with Yahweh, the God of the Old Testament, and was brought in opposition to Christ of the New Testament. As the Demiurge was essentially evil, all his work was also evil. In consequence, not only the Law of the Jews, but all law was intrinsically evil. The duty of the children of the Good God was to find true spirituality by ignoring the supposed moral precepts of the Demiurge and prove themselves to have transcended any association with the world of matter. This led to the wildest orgies of antinomian Gnosticism. Plotinus criticized Gnosticism in the ninth tractate of the second Enneads, entitled "Against Those That Affirm the Creator of the Cosmos and the Cosmos Itself to Be Evil." Plotinus criticizes his opponents for “all the novelties through which they seek to establish a philosophy of their own” which, he declares, “have been picked up outside of the truth”; they attempt to conceal rather than admit their indebtedness to ancient philosophy, which they have corrupted by their extraneous and misguided embellishments. The majority view tends to understand Plotinus’ opponents as being a Gnostic sect. Several such groups were present in Alexandria and elsewhere about the Mediterranean during Plotinus’ lifetime, and his criticisms bear specific similarity to Gnostic doctrine. Plotinus points to the Gnostic doctrine of Sophia and her emission of the Demiurge for example. Christian critics of the idea of the Demiurge begin in the New Testament. The First Epistle to Timothy, for example, says, "Command certain men not to teach false doctrines any longer nor to devote themselves to myths and endless genealogies." (1:3-4) This is apparently a reference to Gnostic mythology, which often involved long lists of intermediate spiritual powers between the Supreme God and the Demiurge. Later Christian writers directly criticized Gnostic teachers and their doctrines. Since many Gnostic writings themselves were destroyed by the Church once it had the power to do so, these anti-heretical authors were the main source of knowledge concerning ancient Gnostic doctrines about the Demiurge until the discovery of the Nag Hammadi Library and other Gnostic works in recent centuries. This page was last modified on 6 November 2017, at 22:57.